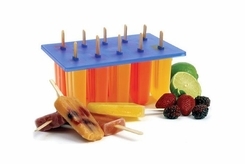 Norpro's Frozen Ice Pop Maker, makes 10 3oz treats. High quality, durable plastic with aluminum top. Create your own unique frozen treats using juices, purees, yogurt, gelatin, fruit, ice cream, pudding, jams and jellies. 24 sticks included.